Donovan "Don" E. Smucker: college professor and minister; born 12 November 1915 in Bluffton, Ohio to Boyd and Mary (Ebersole) Smucker. He was the third son in a family of four sons. He married Barbara Claassen (1 September 1915-29 July 2003) on 21 January 1939. They had two sons and one daughter. Donovan died 13 December 2001 in Bluffton, Ohio; he was buried at the Maple Grove cemetery in Bluffton. In 1932 Donovan graduated from Bluffton High School, and in 1936 from Bluffton College. As a student he excelled in debate. He then attended Yale Divinity and Graduate School, 1936-1938. He directed the Kansas Institute of International Relations at Bethel College in 1938/39 and then served in various positions for the Fellowship of Reconciliation from 1939-1942. During that time he took part time studies at the Oberlin College Graduate School of Theology. Smucker pastored the Wadsworth First Mennonite Church in Wadsworth, Ohio from 1942-1944, and was ordained as a minister at that time. He studied at Princeton University from 1944-1947, when he graduated with the B.D. degree. Donovan Smucker spent the years from 1947-1958 at Mennonite Biblical Seminary in Chicago, prior to its move to Elkhart, IN. During this time he completed his M.A. (1953) and Ph.D. (1957) at the University of Chicago. In the next decade he taught at Lake Forest College near Chicago (1959-1967) and served as President of Mary Holmes College in West Point, Mississippi (1967-1969). The latter was an African American college, and this period proved to be a difficult time in Smucker's life. He was seen as a white "liberal" at a time African Americans increasingly sought to direct their own institutions. In 1970 Donovan and Barbara moved to Waterloo, Ontario where they lived for 24 years. 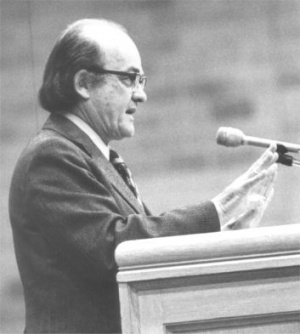 Donovan served as Professor of Social Sciences and Peace and Conflict Studies at Conrad Grebel College from 1970 until he retired in 1981; he continued at Conrad Grebel in various capacities until 1988 while also undertaking a variety of interim pastoral assignments. Always a powerful preacher, he was best remembered by many for his insightful pastoral prayers. During the Waterloo years Barbara also became internationally known as a children's author. Donovan was very supportive of Barbara's public life, and in retirement enjoyed taking her to various readings at schools and bookstores. Donovan and Barbara moved to Bluffton, Ohio in 1994, where they lived until his death. Smucker's major publications included: The Origins of Walter Rauschenbusch's Social Ethics (1994, a revision of his Ph.D. dissertation); The Sociology of Canadian Mennonites, Hutterites, and Amish : a Bibliography with Annotations (1977, with a supplement published in 1991); The Theological Basis for Christian Pacifism (a booklet for Mennonite Central Committee in 1953); Jerome M. Smucker : Pioneer Ohio Mennonite Entrepreneur (self-published, 1996); and, A Catechism of Peace in a World at War : With a Case Book on Non-violence (with Barbara Claassen Smucker, a booklet for the American Friends Service Committee during World War II for use in Civilian Public Service Camps). Donovan Smucker was a Christian ethicist, primarily concerned with issues of active peacemaking and improved race relations. During his years at Mennonite Biblical Seminary he was one of the major academic conversation partners within Mennonite circles shaping the direction of the church's peace theology. This is reflected in the number of articles he published in the Mennonite Quarterly Review in the late 1940s and early 1950s. Unfortunately his early scholarly vigor was not sustained after he left Mennonite Biblical Seminary, and his creative work in Christian ethics lapsed. Nonetheless, his positive ecumenical spirit, combined with a passion for racial harmony and social justice, contributed richly to the Canadian Mennonite community. Kreider, Robert S., David J. Rempel Smucker, Roy H. Umble. An Ebersole Story: the Ancestry and Descendants of Abraham D. Ebersole (1822-1892) and Anna Rutt (1827-1904). Goshen, Indiana: Ebersole Family Association, 1996:46-48. Obituary bulletin, December 16, 2001. Warkentin, A. Who's Who Among the Mennonites. North Newton, KS: Bethel College, 1943: 226-227. Steiner, Sam. "Smucker, Donovan E. (1915-2001)." Global Anabaptist Mennonite Encyclopedia Online. January 2002. Web. 25 Apr 2019. http://gameo.org/index.php?title=Smucker,_Donovan_E._(1915-2001)&oldid=105162. Steiner, Sam. (January 2002). Smucker, Donovan E. (1915-2001). Global Anabaptist Mennonite Encyclopedia Online. Retrieved 25 April 2019, from http://gameo.org/index.php?title=Smucker,_Donovan_E._(1915-2001)&oldid=105162. This page was last modified on 23 December 2013, at 15:49.